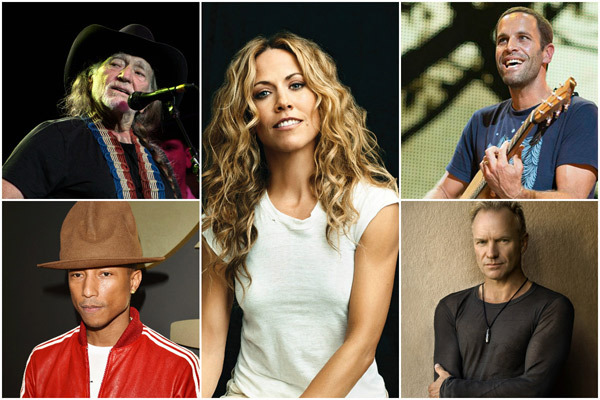 MUMBAI: Sheryl Crow, Jack Johnson, Ziggy Marley, Willie Nelson, Sting, and Pharrell Williams will feature in an exhibit titled ‘Earth in Concert: Protecting the Planet through Music’, due to their contribution to raising awareness of global issues through their music. Johnson, who is working on a completely new composition about reducing plastic pollution in the ocean, will also be supported by visitors. ‘Earth in Concert’, which opens at California Science Center on 12 November, 2015, is an exhibit that has been created in partnership with California Science Center, the Grammy Museum, and Global Wildlife Conservation. The exhibit will feature multimedia and interactive experiences that will be based on the examination of the status of biodiversity in oceans, grasslands and forests, while exploring how several artists and musicians have helped to raise awareness of global issues that present a threat to the planet. "This exhibit demonstrates a remarkable blend of art and science," said California Science Center president Jeffrey Rudolph. "The work of these notable musicians illustrates the need to protect the biodiversity in our natural world." -Exhibit visitors will also use their sense of sight and touch to investigate animal adaptations and guess whether an animal is a carnivore or herbivore. "Our partnership with the California Science Center and Global Wildlife Conservation on this new exhibit will mark the first time the Grammy Museum has explored how artists have used music as a platform for shedding light on the many threats to our Earth's biodiversity," said Bob Santelli, executive director of the Grammy Museum. "We hope what visitors see and learn through Earth in Concert will inspire them to take steps to reduce their own ecological footprint." Grammy winning singer, Sheryl Crow, who has delivered hits like ‘Soak Up the Sun’, ‘A Change Would Do You Good’, ‘Strong Enough’, and ‘All I Wanna Do’ , has used music to talk about global warming, alternative energy sources, and the destruction of natural habitats in America. Yet another music talent- Johnson, who has been actively supporting ocean centric activity and donated to charities to make the planet a green, also made his place at the exhibit. He was named United Nations goodwill ambassador for his multi-artistry and his commitment to finding alternatives to disposable plastics. Bob Marley’s eldest son and environmentalist- Ziggy Marley - went out to sing the message of deforestation, climate change, and pollution, through his second album ‘Fly Rasta’ which was a 2014-Grammy winning album. Veteran country musician- Willie Nelson- owns bio-diesel brand Willie Nelson Biodiesel, which is made from vegetable oil. Other than the bio-diesel brand, he has also been actively involved in the longest running concert which started in 1985 with a vision to preserve the American family farm. In 1989, English singer, Sting and his wife Trudie Styler, founded The Rainforest Fund, which will support indigenous populations throughout the world's rainforests in their efforts to protect their environments and fulfil their political, economic, social and cultural rights. Grammy winning producer Pharrell Williams announced a collaboration between G-Star Raw and his textile company Bionic Yarn, which was born after he felt the need to tackle issues related to the environment. G-Star Raw and Bionic Yarn recently released a collection of denims, made from recycled plastic that is found in the ocean titled ‘RAW for the Oceans’.